George and Mildred is a British sitcom produced by Thames Television and aired from 1976 to 1979. 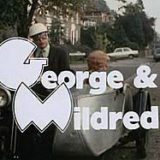 The show was a spin-off from the series Man About the House and depicts the adventures of the constantly bickering couple George and Mildred Roper. George played the lazy good-for-nothing husband, and Mildred played the wife who longed for better things. The series ran for 5 series, totalling 38 episodes. 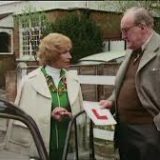 A Driving ambition – Mildred secretly takes driving lessons as she does not want George to teach her. When he sees Mildred in a car with a man, he comes to the erroneous conclusion that she is having an affair. Mildred is happy to let him believe it as he is paying more attention to her than usual. George questions the driving instructor and finally discovers the truth. 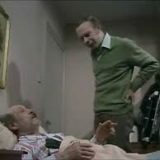 Life with father – George’s father turns up at George and Mildred’s house and claims that he was thrown out of the old’ folks home. It is revealed that he was thrown out because they would not allow him to keep his ferret there. Fourmile accidentally kills it by running over it, then gives them a live one to replace it.